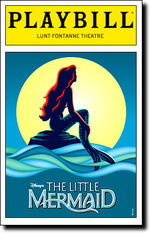 Disney's production of the Little Mermaid brings the movie to life on stage. A story of a little mermaid who falls in love with a prince. The Little Mermaid was an ok broadway show... it was more or less what I expected from a Disney performance. Everyone probably knows the story - the Broadway version makes a couple minor changes, but it's pretty true to the Disney film version of the story. I was a bit disappointed in the music and the costumes. Don't get me wrong - the costumes were bright and colorful, but they didn't seem to be as dazzling as they were in The Lion King. The songs that came from the movie were great - just what one would expect. However, they added a lot of songs for the Broadway version of Little Mermaid, and those songs weren't quite as good. A lot of them were boring and quite repetitive. I had high expectations for a Disney production, and they weren't quite met. The show was pretty spectacular, but I was expecting even more. The singing was really good. I loved the transitions when the characters were moving between under and over the sea. This was a very child friendly show. Many of the kids were sitting on seat cushions to help them see. I didn't have high expectations going into this show and absolutely LOVED IT! It was colorful and happy and seeing kids love it was the icing on the cake.